In July 2005, an international aid agency was preparing to distribute supplementary food rations at a therapeutic feeding center near Maradi, Niger. Fearing that few people would show up, aid workers spread the word in nearby villages. This modicum of mobilization led to a near riot, as hundreds of women crowded in, all desperate to obtain food. Such a scene, which would have been unheard of in previous years, underscores the extent to which last year's emergency differed from Niger's long-term problems in feeding its population. Government authorities and United Nations officials maintain that the nutritional emergency was caused by drought and an infestation of locusts in 2004. Although these events affected vulnerable people, both were localized and accounted for a loss of only 11 percent of Niger's total cereal production for 2004. Many people in Niger face chronic food insecurity, but there were clear warning signs that 2005 would be much worse than usual. In March 2005, severely malnourished children began pouring into the Médecins sans Frontières (MSF) feeding center in Maradi, and surveys warned of a disaster with the next harvest more than six months away. Food reserves began to run out, and cereal prices went up. People could no longer afford enough food for their families or medical care for their sick children. They resorted to selling off their cattle, and livestock prices plummeted. Urgent measures were required. Yet Niger's consortium of decision makers – the government and its international partners, including countries in the European Union, United Nations agencies, and the Famine Early Warning Systems Network of the U.S. Agency for International Development – saw the food deficit as a circumscribed problem and feared that relief assistance would disturb the market and hamper long-term development goals. Instead of undertaking targeted distributions of free food, as had been done in neighboring countries, this consortium made cereals available at subsidized prices, but in insufficient quantities. In effect, food was sold to starving people at a price few could afford. MSF saw the effects of this crisis in our feeding centers. 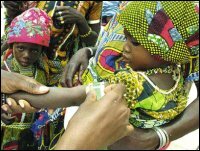 More than 3000 children with severe malnutrition were admitted to emergency facilities in Niger during the last week of September 2005 alone. Between January and November 2005, my colleagues and I treated more than 60,000 severely malnourished children – more than six times as many as were treated in 2004. "Bracelet of Life" Being Used to Measure Upper-Arm Circumference. Photo © Anne Yzebe/Médecins sans Frontières. In order to meet this vast need, we have been relying on a relatively new outpatient approach to the treatment of severe malnutrition. Based in large part on the provision of ready-to-use therapeutic food, the approach has proved effective and should help feeding programs elsewhere expand their reach. Such treatment programs also can be unexpectedly counterproductive, compromising the health of patients' siblings, who may be left at home without their mother while she remains at the feeding center with the patient. Furthermore, keeping large numbers of children in one place, even under ideal conditions, increases the risk of nosocomial transmission of infections, and the risk of treatment errors is increased in large centers during emergencies. Home-based or outpatient care for severe malnutrition has been attempted in countries such as India and Bangladesh. A limiting factor has been the difficulty of providing an appropriate nutritional product that does not require the addition of water, since the water that is available may be of suspect quality. Today, however, there are ready-to-use therapeutic foods that are as effective as therapeutic milk products. BP-100, for example, is a nutrient-fortified wheat-and-oat bar, and Plumpy'nut is a peanut butter—like paste containing the balance of lipid, sugar, and protein (macronutrients) and minerals and vitamins (micronutrients) that promotes rapid growth in severely malnourished children.2 Plumpy'nut comes in individual packets that are essentially immune to bacterial contamination; and because they are sealed, single servings, they are not likely to be shared by other children. Neither BP-100 nor Plumpy'nut requires the addition of water, so questions about proper dilution and the availability of clean water are eliminated. Nor do they require cooking or other preparation. I believe that these therapeutic foods should be considered essential medicines and should be integrated into regular health care services, rather than simply made available during emergencies. In Maradi, we have been treating most severely malnourished children with these foods on an outpatient basis, with a cure rate of nearly 90 percent. Although anthropometric data are essential for establishing entry and discharge criteria, it has become clear that the appetite and clinical status of the child are the most sensitive indicators of risk and of the necessity for hospitalization. Children who do not eat what they are fed at a nutritional rehabilitation center usually have serious infectious or metabolic disorders that necessitate hospitalization. But for most other children, and for children whose condition has been stabilized in an inpatient setting, weekly medical consultation is sufficient for health care providers to diagnose and treat the common, non—life-threatening complications and infections associated with severe malnutrition. Most children in outpatient programs for severe malnutrition who are treated with the new solid therapeutic foods are cured in four weeks, without having to be hospitalized. 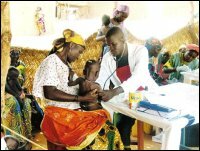 Physician Checking a Child's Heartbeat, Aguié, Niger, 2005. Photo © Kevin P.Q. Phelan/Médicins sans Frontières. Of course, inpatient centers, or stabilization units, are needed for the more intensive treatment of severe, complicated cases of malnutrition. In Niger, roughly 30 percent of the children treated by MSF workers spend at least a few days as inpatients, primarily because of severe concomitant medical problems such as respiratory infection, septicemia, severe diarrhea, severe dehydration, and severe anemia associated with malaria infection. Within such inpatient centers, intensive care units are set up to handle the most catastrophic cases, and most deaths associated with malnutrition occur within this group. Many of these patients would be difficult to save even in developed countries. Most children treated in a stabilization unit do survive, however, and they are soon discharged to an outpatient program. The availability of effective treatments for malaria and bacterial disease, the use of special rehydration solutions, the availability of transfusions and supplemental oxygen, and the organization of intensive care permit efficient intervention in the worst cases. The overall rate of mortality among children receiving either inpatient or outpatient care from MSF in Niger has remained near 5 percent – even in the midst of this emergency and despite the typically destabilizing rapid scale-up of treatment programs. For years, almost nothing was done for children in Niger with severe, acute malnutrition. This lack of treatment is all the more surprising because Niger is a peaceful country with a stable government and a functional ministry of health that has welcomed global assistance and followed the advice of international development consultants. Among government and United Nations officials, aid workers, and media commentators, the catchword for the situation in Niger has been "chronic." For each affected child, however, acute malnutrition is not a chronic problem, but a medical emergency – one that carries a high risk of death. The families of our patients in Niger have clearly understood this fact. The rate of participation in our nutritional program has been very high, with less than 5 percent of patients dropping out once they have entered. Some mothers walk long distances each week to participate, and others from neighboring villages share taxi costs. They can see that the treatment is working for their children. Medical professionals, wherever they practice, must insist that the simple, effective, and affordable treatments that now exist be made available to all children who are affected by acute malnutrition. Dr. Tectonidis is a nutritional specialist in the Medical Department of Médecins sans Frontières, Paris. 2. Briend A, Lacsala R, Prudhon C, Mounier B, Grellety Y, Golden MH. Ready-to-use therapeutic food for treatment of marasmus. Lancet 1999;353:1767-1768.